Great pre-owned condition! Works and sounds great! All cords included. It's the ultimate in portable sound for music that goes wherever you go. Bring your music to the beach, the pool or turn any room into a concert hall. The acoustic research portable wireless speaker makes noise wherever you take it. Inspired by hues in the Northern Lights, the Santa Clara features multi-color or white area lighting with "Breath" or "Beat" modes to set the mood. For double the power, Santa Clara can automatically connect two speakers via Bluetooth. Acoustic Research AWSBTSK Portable Wireless Bluetooth Speaker . University of Cincinnati Bearcats Logo . Excellent sound quality that you would expect from Acoustic Research. Weather resistant Bluetooth rechargable speaker can be used indoor or outdoors. LED mood candle provides intimate lighting. Two-way design (2-in tweeter / 3-in woofer). Bluetooth Speaker. Includes power cord and bluetooth Speaker. Aux Input: gives you the option to connect directly to your portable devices. Up for sale is 1 ACOUSTIC RESEARCH AR AWS53 Indoor Outdoor Wireless Portable Speaker! Acoustic Research AR. Speaker takes 6 AA batteries (not included). NO OTHER PARTS/ ACCESSORIES ARE INCLUDED. Perfect for indoor and outdoor use. Enjoy your music in style indoors or out with The Acoustic Research Heartland Wireless Speaker with LED candle. 360º area LED candle light. Lithium battery. 2-way acoustic design. Used in very good condition. Easy, wireless installation. Sleek, portable design. Includes 2 speakers, 1 transmitter, 1 AC power adapter. Speakers are aged copper in color. Take your music to your outdoor patio, deck or gazebo. Up for sale is a pair of 2 ACOUSTIC RESEARCH AR AWS53 Indoor Outdoor Wireless Portable Speakers! Acoustic Research AR. NO OTHER PARTS/ ACCESSORIES ARE INCLUDED. Includes: Speaker, AC power adapter, Aux-in. Weather resistant. Play up to 14 hours with 6 AA batteries (not included). It provides the perfect combination of excellent sound quality and clean design so you can enjoy your music in style. The speaker adds acoustic flare with 4-watt sound. The LED candlelight will set a calming and cozy mood wherever you take it. Trending at $28.81eBay determines this price through a machine learned model of the product's sale prices within the last 90 days. AR Wireless Speaker. Works with bluetooth and direct connection. 2 wireless Acoustic Research Speakers and 1 transmitter. Brand new, in box. 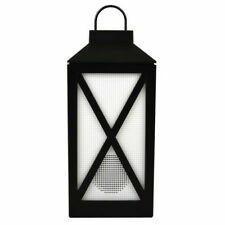 Acoustic Research Portable Wireless Speaker LED Candle bluetooth Indoor Outdoor. I bought this to use in our new house before we moved in, and decided to use something else. Never removed from the box. PayPal only, please. I ship via USPS Priority Mail within 3 days of payment received. I will provide tracking as soon as item ships. Thanks for looking! This listing is for Acoustic Research AW825 Indoor/Outdoor Wireless Portable Speaker Transmitter. This has been tested and it works great. I offer a 30 Day Warranty. Actual item pictured is the one you will receive. PLEASE REFER TO PICTURES FOR CONDITION This comes with the Speaker, Transmitter, Auxillary Cable, Power Cables. What you see is what you get. Please email me if you have any questions. Acoustic Research Glendale Portable Wireless Speakers: Pair 2 speakers together from your smartphone or tablet. Listen to two speakers from one source or a single speaker from one source. Bluetooth Compatible for Wireless Streaming. Great product works great outside and great sound. Acoustic Research Hatteras 40 Watt Portable Indoor Outdoor. 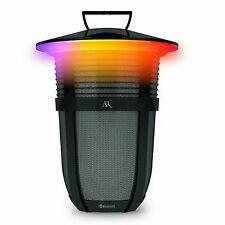 Wireless Light Up Bluetooth Speaker. Does not include Manual or a Aux in Cable. Pre-owned, in Distressed Box. Normal usage, normal wear but in nice working condition. Make: Acoustic Research. Check with the manufacturer for more warranty information. 3.5mm audio input connects to your device's headphone jack. 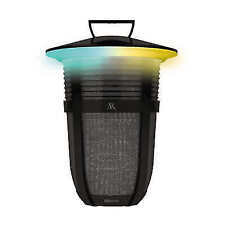 Genuine Acoustic Research (AW825) Portable Wireless Outdoor Speaker **READ** . Condition is New. Shipped with USPS Priority Mail. In good working condition. Includes speaker, transmitter, 3.5 headphone to RCA cord, and 2 power supplies. It provides the perfect combination of excellent sound quality and clean design so you can enjoy your music in style. The speaker adds acoustic flare with 5-watt sound. The LED candlelight will set a calming and cozy mood wherever you take it. Acoustic Research AW825 speaker With transmitter Tested & Works Great. Condition is Used. Shipped with USPS Priority Mail. Liven up your lighting with breathe or party mode so the lights follow the beat of your music. 10 Watt Sound With Bass Resonator - Enjoy your favorite music through a 2 way speaker system that features a mid-range driver, tweeter, and bass resonator to combine for 10 powerful watts of clear sound. The 30 watt, 2-way system plus enhanced bass radiator provides amazing audio performance. It’s also IP55 Rated weather-resistant and perfect for any season. Now there’s no reason your party should stop when the sun goes down. Acoustic Research AWSBT4BK Berkeley Series 3.5 mm Bluetooth Speaker with Direct Connect - Black. Enjoy great sound wherever you are and whenever you want it. Get the ultimate flexibility from 2 connection options: Bluetooth wireless lets you stream your playlists and other audio from your smartphone. Model: AWS5 / Take your music where you want it. - 2 " tweeter, 3 " woofer, 5 watt RMS. - 2 way acoustic design with bass boost. - Flexible - place speaker anywhere, indoors or out. Speaker / Receiver. Acoustic Research Portable Wireless Speaker 1000002735 044476087387. This speaker adds acoustic flare with 4 watt sound and equipped with LED candlelight will help set a calming mood to make your space cozy. This wireless speaker also has a built in rechargeable battery that offers up to 12 hours of playback. This product epitomizes AR's philosophy of product development: close attention to design as well as performance, resulting in great wireless audio combined with elegant design that matches its surroundings. Acoustic Research Indoor Outdoor Wireless Speaker with Transmitter and Cables. Wireless 900 MHz Transmitter. - Transmitter Base. - Transmitter Cables. Speaker runs on AC Power or 6 AA Batteries (Not Included). Portable Wireless Speaker with LED candle. Acoustic Research Portable Wireless Bluetooth Speaker "Black Cat"